PRODUCT: SIEVERT #2942 1.26" DIAMETER 88,700 BTU POWER BURNER. FITS SIEVERT PRO NECK TUBES. PRICE/EACH. 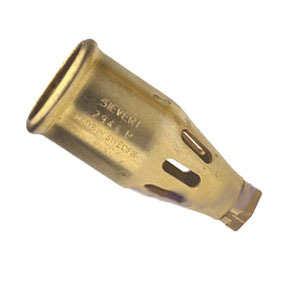 Hot-air burner for soft soldering. Capacity @ 58 PSI: 88,700 BTU/Hour. SIEVERT #3507, 20 INCH NECK TUBE (508mm). PRICE/EACH.